After the fire in Malibu, there is a potential threat of a flood, mudslide or rockslide during the rainfall tonight, which is anticipated to last until Thursday. In 1983, a fire forced Giles Manwaring out of his Malibu home with nothing but the clothes on his back. Now, Manwaring is helping other Malibu residents after the recent devastating fire. He was one of many shoveling sand into bags at Zuma Beach in Malibu on Wednesday. 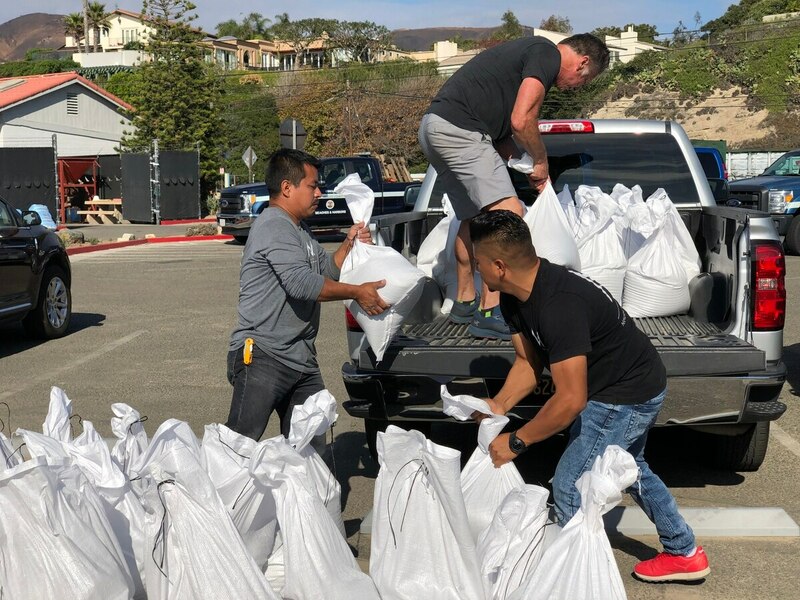 Both LA County workers and Malibu residents were preparing bags for others to protect their homes from the flood, anticipated to happen during this evening's rainfall. Malibu officials sent out a public service announcement urging residents to prepare for a potential flood during the showers that are anticipated to last until Thursday. 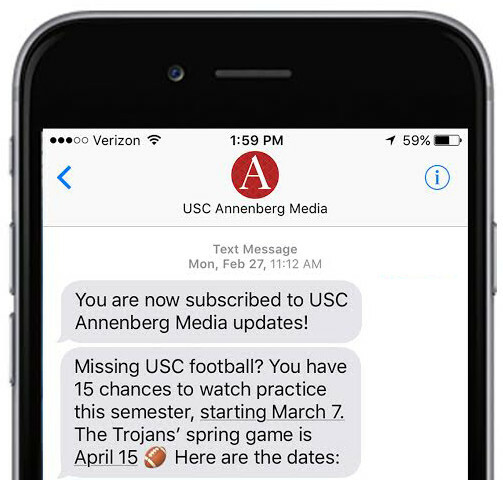 The memo said that there is a high probability of floods, mudslides and rockslides. 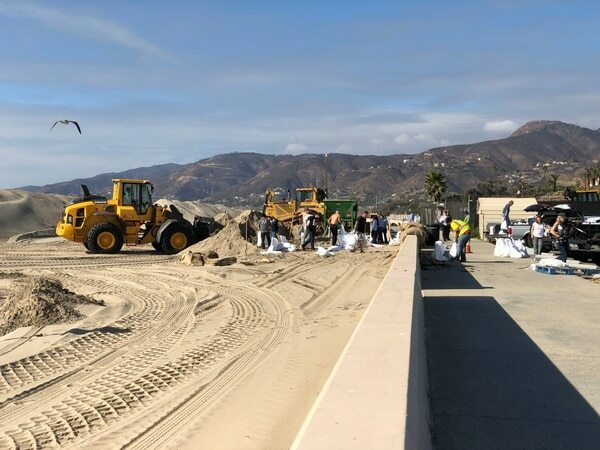 Andy Jackson, resident of Malibu, was filling his truck with sandbags to barricade and protect his home from the possible flood and mudslide. "After this recent fire all the houses are burned, they're vacant, bare hillsides, and with the pending rain that's supposed to come, it has a potential to be a catastrophe," Jackson said. Jackson was also picking up sandbags for people in his block who were not able to drive down to Zuma Beach to pick some up themselves. "We're just trying to get as many sandbags to all these properties to try and control the flow of mud and water," he said. Fire Captain Kevin Harmon said that Malibu experienced its first day of rain last week after the fire, but nothing was damaged. This false alarm prepared residents for potential dangers, so Harmon feels optimistic about the residents' preparedness for tonight's rainfall. Manwaring said he worries about both the preparedness of others and the closure of PCH. "The biggest thing we have here is Pacific Coast Highway, that's our main boulevard in Malibu, and once that gets closed and mud gets down that just screws us up," he said. "They've done a lot," Manwaring added regarding the hardworking officials during the recent fire. "It is a lot of camaraderie. You need a lot of people, and it's fascinating that we've become very dependent on each other… that's a beautiful thing." Jackson agreed with Manwaring and said that the camaraderie between residents always surprises him during times like these in Malibu. "In a situation like this, it's incredible how the older people and especially the younger people ban together to help everybody regardless if it's your own personal property or not," he said. City officials are telling Malibu residents if the showers and the city conditions worsen they should prepare to potentially evacuate the area again.